Hiya ladies and gents! 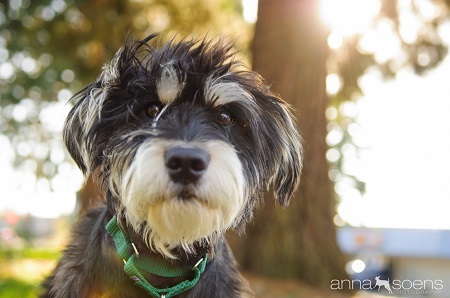 My name is Mitch and I’m a spunky two year old schnauzer mix. I’m a curious, confident little dude and I come 100% guaranteed to make all your adventures 26 lbs more awesome. Whether it’s a jaunt around town, puddle jumping in the gorge, or netflixathons in bed, I’m all in. I snuggle hard, so I hope you can keep up with me. Applicants who have a knack for typing/texting/reading with one hand, and giving stellar belly rubs with the other get a bonus point. Applicants who can put aside all that techno geekery to invest in a double-handed belly rub get quadruple points. Two hands and a foot? I think my head would explode in delerium. But I’m totes game to try. I’ll be keeping tight tabs on the score, so fill out an application fast before I’m snatched up by some crazy octo-armed person. I love my crate, play well with other pups, and even enjoy a good spa day (just don’t tell my guy friends). Fill out an application at Pixieproject.org to meet all 26 lbs of awesome. I’m fully vaccinated, neutered and microchipped.